A couple of chaps in Västerås, Sweden decided that the world needs a simple, elegant bicycle on which to ride down to the café for an espresso. The result? Strömmen. Translated that would be The Flow, The Stream, The Current. 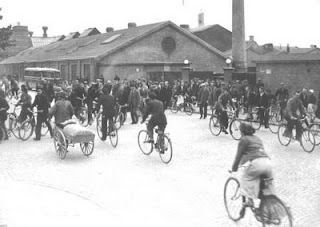 The name is inspired by the massive flow of bicycles in Västerås back in the day when the citizens all pedalled to work at the town's ASEA factory. Photo from a local historian's website. To this day, Västerås in Central Sweden is one of Sweden's main cycling towns, with over 30% trips by bike. They even have a wicked cool statue celebrating their cycling history. 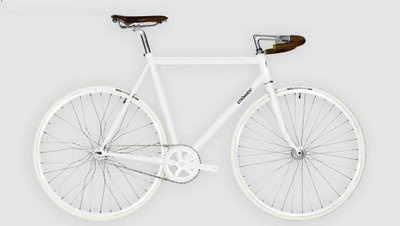 Anyway, Jonas Wallin and Daniel Ingdahl created this all-white, fixed gear 'café racer' with a steel frame, with parts chosen from a variety of suppliers in the UK and the US. They assemble them in Västerås. Only 50 have been built and they have just become available to the market, costing 5000-6000 Swedish kroner according to their website and $600 according to an article I read about it. They got the idea out of the blue and catalouged their journey from idea to product on their website.